Check to be sure that you have painted all of the underpainting where it needs to be around the masked areas. Thoroughly dry your painting. It needs to be bone-dry for this next step. Now it is time to remove the masking. 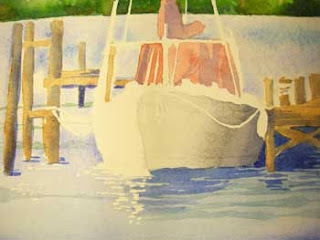 Use a masking fluid pickup, the best, cleanest and most efficient tool for removing masking. Any other tool will leave residue on your paper, or leave unattractive marks. You can purchase a masking fluid pickup, which looks like a rubbery eraser, at most good art supply dealers, or go to CheapJoes.com, one of my favorite online suppliers. Simple rub the masking fluid pickup over the areas where you applied masking. You can actually use a scrubbing motion and not have to worry about disturbing your paint. With very clean, dry hands, gently touch your paper to see if any masking residue is left, and use the pickup tool until it is completely smooth and clean. Now you have some beautiful, crisp whites to add sparkle to your painting!